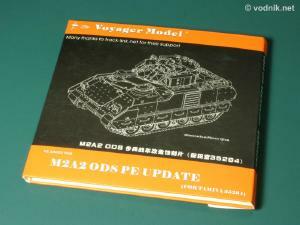 One of recent releases from Voyager company is a photoetched detail set for Tamiya M2A2 ODS Bradley model. 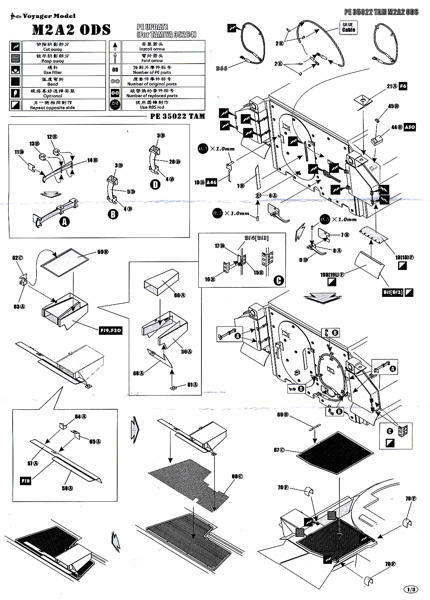 The set is specifically designed for latest release of Tamiya Bradley and includes some parts specific to this version, but can also be used to detail older M2A2 non-ODS kit, as majority of parts are common in both versions. PE35022 set is very cleverly packed in a thick paper compact disc case. This way of packaging definitely makes Voyager sets look more interesting at first sight than typical PE sets from other manufacturers. Inside the case we find instructions printed on all four sides of two A4 size paper sheets and a resealable plastic bag with all parts inside. These however are not just put together in one bag - inside the first bag are two biggest PE frets and another zip-bag, then inside it are three PE frets and yet another even smaller zip-bag with parts! Instructions diagrams are quite clear and seem to be easy to follow. While the set is nominally a "PE Update" in addition to six photoetched frets it also includes two plastic (ABS) rods and a length of copper cable. 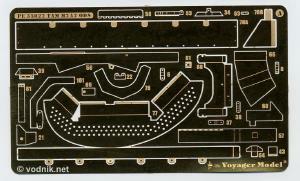 Very nice feature of Voyager sets is the use of brass sheets of various thickness for etching parts, so more accurate results can be obtained when thicker parts are needed without the need to laminate a few layers of thin brass together. Another good idea is the use of copper for some parts, which need to be softer than brass to be shaped realistically - like straps, mud flaps etc..
Click on picture to enlarge it. 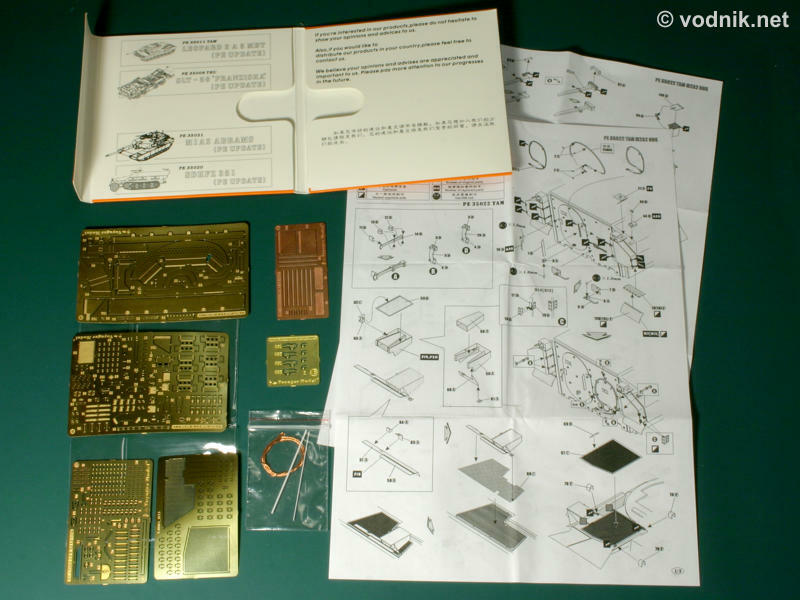 Last page of instructions contains a few pictures of PE parts attached to unfinished model and ads of other two Voyager sets. F - 32 mm x 64 mm / 0.15 mm thick copper. - correct M2A2 style engine compartment fire extinguisher guard and handle. Finally! 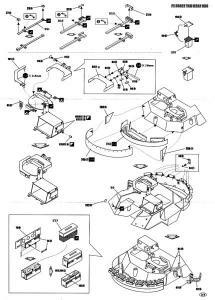 Tamiya failed to update this part in their M2A2 kits and Eduard only improved kit part in their M2A2 set instead of providing correct one. - hinge parts for TC's hatch - almost the whole hatch assembly is replaced with PE parts with axle made of a piece of ABS rod. Only the main hatch shell part is kept from the kit. - some other small detail parts for the hull and turret. Click on picture to enlarge it. Two smaller photoetched frets C and D.
while fret F is made of copper. Click on picture to enlarge it. 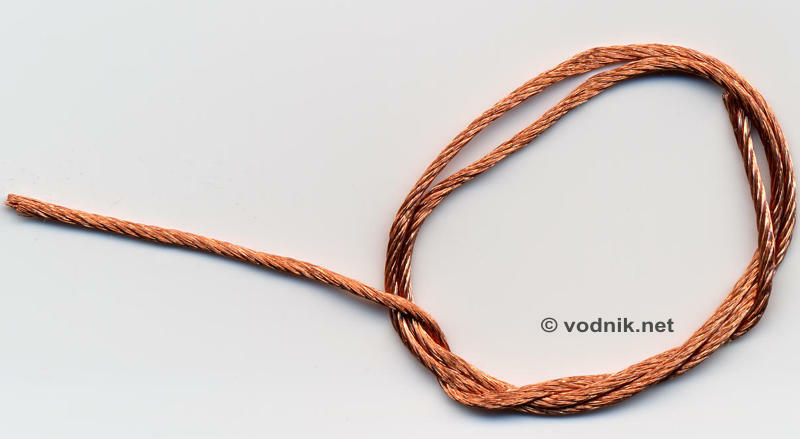 Copper cable. As you can see from the list above, the set is rather comprehensive, but unfortunately I found some problems in it. 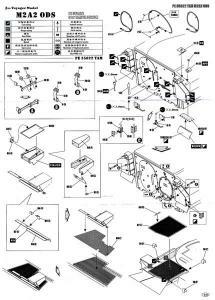 I see two types of problems: parts which are included, but are not accurate and omissions. 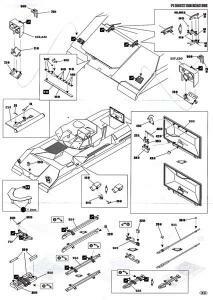 Of course omissions are a matter of choice made by manufacturer - after all it is almost impossible to include all possible detail parts in a single aftermarket set. 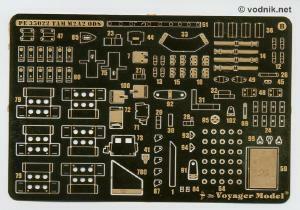 Some parts in Tamiya kit however really need replacement or extra detailing and were missed by Voyager, so I want to mention them as well. - mesh for intake grille (part 67C) should be MUCH finer. In real Bradley this mesh is very fine - it is actually hard to see intake grilles underneath it even from close distance, because holes in the mesh are so small. This mesh should be much finer than exhaust mesh, but in Voyager set they are similar. 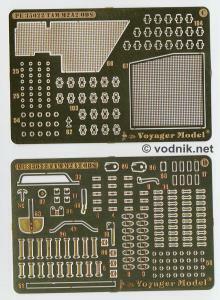 I suggest using some very fine generic PE mesh available from some manufacturers instead of this Voyager part. - small lifting eyes (70F) around intake grille are incorrectly shown in instructions. Only three are shown and all face the same way. Luckily on the F fret four parts are correctly provided, but you must find reference photos to check correct orientation of those parts, as they do not face the same way in reality. - parts 44B and 45B (small detail - some outlet/exhaust maybe - for the rear right corner of the hull. I don't know what it is...) are correct for early M2/M3 and M2A1/M3A1 Bradleys, but this device looks completely different in M2A2 vehicles. - supports for driver's and commander's periscopes guards (76A and 101A) are supposed to be made of round 1 mm ABS rod according to instructions, but in reality they are made of flat steel brackets and should have been provided as PE parts. - details are provided for swim barrier tripods, but those tripods are inaccurate for M2A2 Bradley in Tamiya kit anyway. They were correct for early M2 model, but M2A2 used much larger tripods. And ODS variant had the swim barrier and all tripods and support poles removed completely, so they should not be used for M2A2 ODS models at all. - new lids for smoke grenade storage boxes are provided, but these boxes in Tamiya kits are too small and it would be better idea to provide complete correct size boxes rather than to provide more detailed lids for too small boxes. - brass turret bustle rack is very nice, but inaccurate. 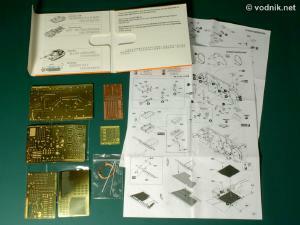 The shape of metal parts is the same as Tamiya plastic parts - problem is those parts were inaccurate. The shape of the rack "floor" was not correct and Voyager missed the opportunity to correct this error. They also over simplified the left front rack wall part (78C) - it was not quite correct in Tamiya kit and is even slightly worse in Voyager set. Missing from PE set is also the large mounting bracket which holds the rack to the antenna support column. This all means that Voyager bustle rack would look much better than original kit part once assembled, but would be just as inaccurate as kit part. 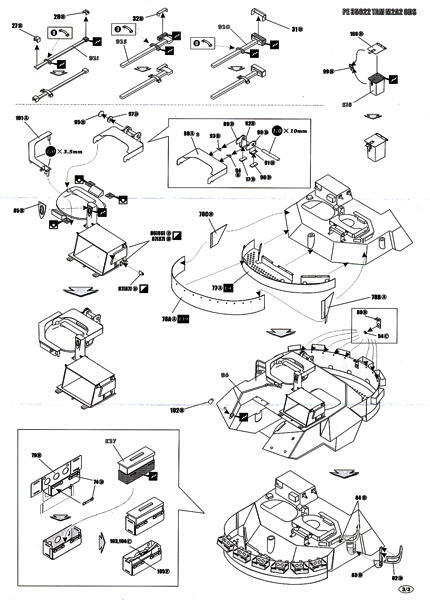 - small part 102B is provided to replace the mounting bracket of targeting reticule support arm, but Voyager missed the fact that in reality this arm is not attached to the mantlet as Tamiya made it, but directly to the cylindrical gun cover. It was easy to correct this error by providing modified PE parts, but instead Voyager gave us direct replacement for inaccurate Tamiya part. - replacement turret antenna guard is provided as part 82D, but while it looks very nice, it is not quite correct as this guard is in reality made of thick metal bars and kit part actually is more accurate here (with exception to vertical part of it which indeed should be better cut off and replaced with PE part 83D). - lots of small details for the turret, e.g. 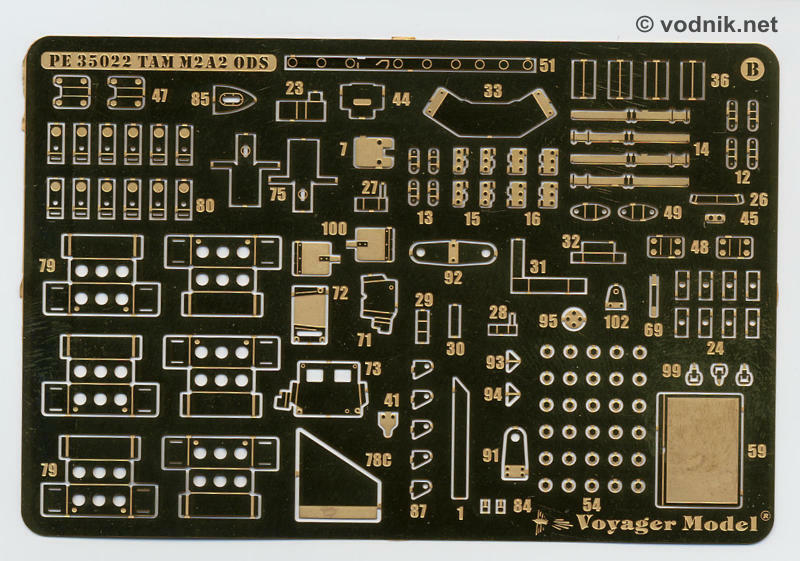 guards for some commander's and gunner's periscopes are missing in Tamiya kit - again almost obvious candidates for PE parts, but not included in Voyager set. 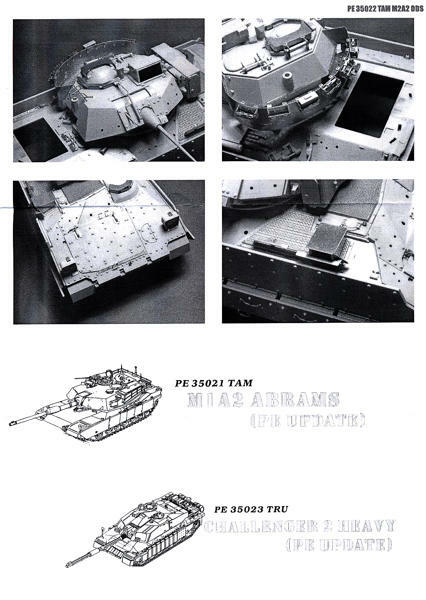 Of course many more things could have been added to make Tamiya model more accurate, but those things mentioned above seem most important. 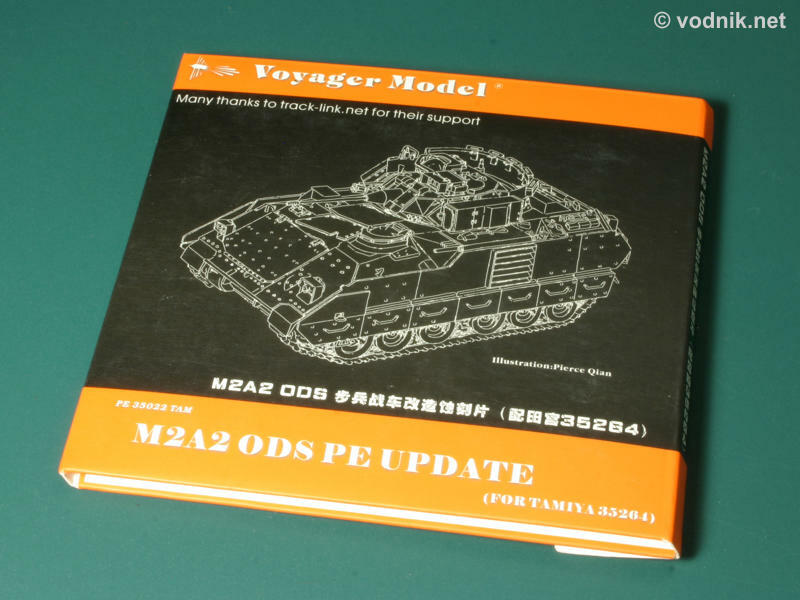 The first two "missed opportunities" above were nicely handled by Eduard in their M2A2 ODS details set, but last three were not, and I hoped that Voyager set might solve those problems. I'm a bit disappointed. To find out more about inaccuracies of Tamiya M2A2 kits please read my article: Accurizing and detailing Tamiya M2A2 Bradley kit. Assembly of some smaller parts included in Voyager set may be quite tricky and probably modelers less experienced in work with PE sets can have problems with them. This is not a flaw of the Voyager set of course, as thanks to this complexity the accuracy of these parts is dramatically improved. It is just a word of caution for those of you who never worked with tiny brass parts and are interested in this set. All inaccuracies mentioned above could probably scare some modelers away from the Voyager product, but it is not as bad as it seems. There are really lots of very nice and accurate details in the set and inaccuracies mentioned above are either easily remedied or not that important to overall look of the model. 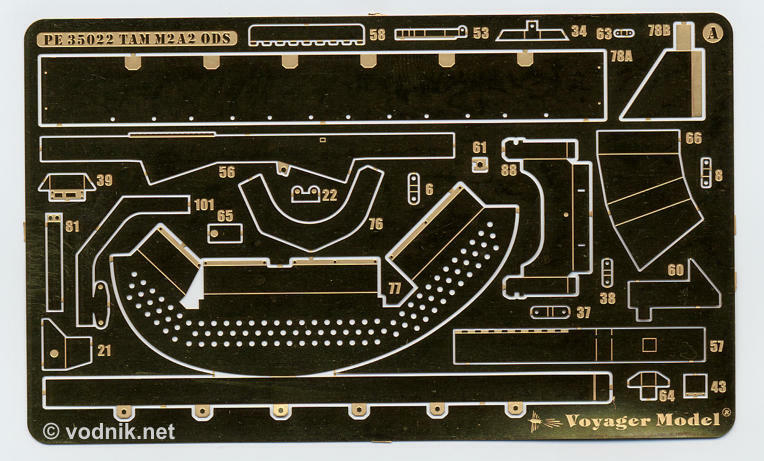 In a few places Voyager made a mistake quite common for aftermarket products manufacturers - instead of providing more accurate replacements for plastic kit parts we just get more detailed and nicer, but also inaccurate photoetched parts. In some other places however Voyager included accurate details missed by Tamiya in their kit and also Eduard in their PE set. If you just use the set without any corrections it will allow you to build nicely detailed Bradley, definitely better looking then Tamiya kit built out of the box, but still inaccurate in some areas. For all modelers who appreciate better accuracy I can say that this set is a very good starting point, as it really helps in detailing the model, while still leaving a lot of space to show scratchbuilding talents.